Americas Cup sailing in Sydney is a unique opportunity to participate as crew on a real America’s Cup yacht. Take the helm, trim the sails, work on the grinders or simply sit back and enjoy the ride as you soak up the atmosphere and sights of spectacular Sydney Harbour. The America’s Cup is the world’s oldest and most prestigious sporting trophy and ultimate yachting regatta. And now you can American Cup sailing first hand. Built for the 1992 America’s Cup sailing in San Diego, the yacht was raced by Spirit of Australia. She placed 6th in the Louis Vuitton Cup and then returned to Australia. Following minor alterations the yacht was put into commercial survey and began operating as a corporate charter vessel. She underwent a full refit and mast replacement in early 2012 making her a very competitive rival to sister ship AUS40. Custom built luxurious racing yacht designed by German Frers with performance cruising in mind. With her central boom sheeting and swept spreader rig, the yacht offers a spacious cockpit finished in teak from which she can easily be sailed by a small crew or raced by a team. 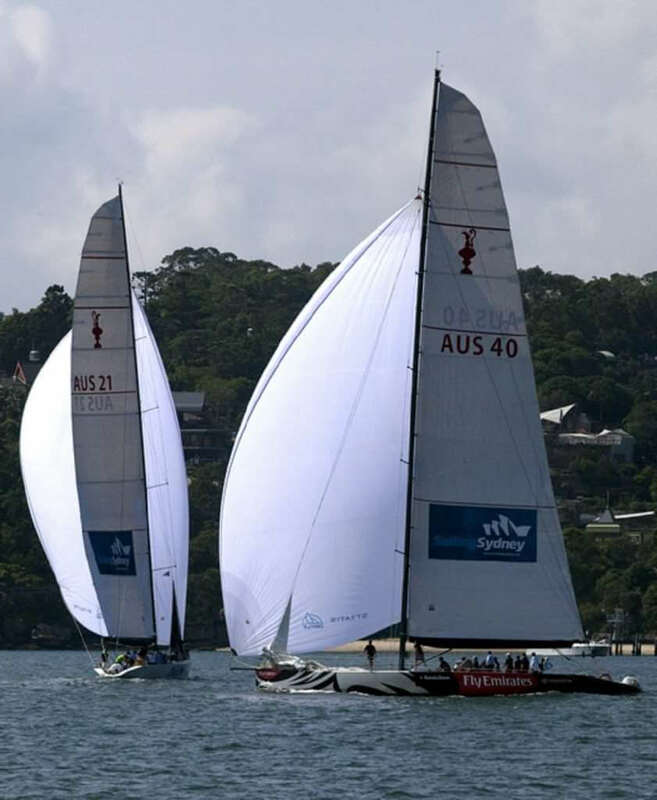 She has competed and placed in numerous regattas as well as completing over 20,000 miles having been to the Whitsundays on 5 occasions, Lord Howe Island twice and numerous passages up the New South Wales coast. Departs from Wharf 9, King Street Wharf, Darling Harbour, Sydney.